The Crown Forces Form Square to fend off cavalry at The Battle of Chippewa/Lundy's Lane event in 2014. Marching steady onto the field for another battle. The Incorporated Militia is on the way! As night falls in Fort Erie, the line fires a volley at the dreaded invaders in the fort! Greetings and welcome to the official website of the Military Re-Enactment Society of Canada. 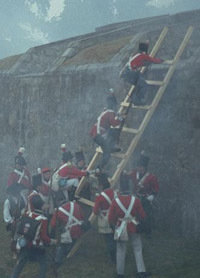 Our members hail from the Greater Toronto Area (Ontario, Canada) and drill regularly at Historic Fort York in Toronto. We are proud to be living historians, representing the Incorporated Militia of Upper Canada (IMUC), during the War of 1812 at various Canadian and US historical sites and events. We invite you, the gentle visitor, to look around the website. There are lots of photos and articles. Please check our calendar of events to see when and where we’ll be. IMUC is always keeping an eye out for new recruits! If you have a love of Canadian history and have ever considered getting involved in historical re-enactments please check out our recruiting page! If you enjoy history... and especially living history... we hope you enjoy our site and our offering here at http://www.imuc.org/. Think about attending one or two re-enactments, joining the ranks and maybe getting a taste of powder! If you miss the original site or need information from it, you can click here to view it. It will not be removed and will always be available to interested parties. Thanks again and we hope you enjoy the new look and the new site. Copyright © 2014 Incorporated Militia of Upper Canada. Rights Reserved.